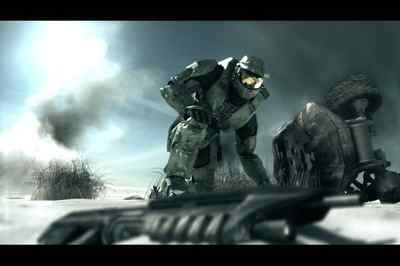 The new CGI/live-action trailer for Halo 3 that ran during Monday Night Football in the USA hit the interpod yesterday. You can check out the crappy-quality Youtube version or download the high quality version from Xboxyde. There’s something important to note about this trailer. This is less a trailer for “Halo 3” than it is for “Halo” as a brand. And there’s a real simple reason for this: it’s a dual purpose trailer. First, it’s meant to remind people of Halo’s (and Microsoft’s) relevance in a post-PlayStation 3 environment. And secondly, it’s meant to “sell” Halo to the movie studios after Universal and Fox got cold feet and pulled the plug on the Halo Movie. Before, they were being asked to put up $135m on a first-time director based on Peter Jackson’s word and they said “no”. Now they’re being asked to put up $135m based on a well-received, highly-polished trailer. Let’s see if they’ll change their minds. Update: I thought this trailer was directed by Neill Blomkamp, who was lined up as the director of the Halo movie before the plug got pulled. It was, in fact, directed by Joseph Kosinski, who previously directed the awesome, beautiful “Mad Love” trailer for Gears of War.